The French government has presented US singer Bob Dylan with the country's highest award, the Legion of Honour, in a brief ceremony in Paris. Presenting him with the award, Culture Minister Aurelie Filippetti said he was a hero for young people hungry for justice and independence. as a spokesman for other people's causes, a BBC correspondent reports. After the speech, he said simply that he was "proud and grateful" and left. No cameras were allowed for the ceremony at the culture ministry. ...A journalist who attended the ceremony said Dylan, 72, had looked distinctly uncomfortable. The singer, who is playing concerts in Paris this week, met Justice Minister Christiane Taubira at a reception after the ceremony, Le Parisien newspaper reports. No details were given. Ms Taubira, who is black, is at the centre of a storm over racism after a far-right magazine compared her to a monkey. A government investigation has been opened into the magazine, Minute. 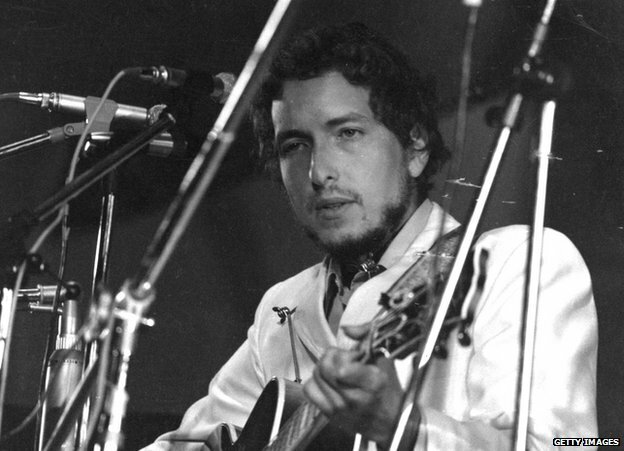 Dylan's award was temporarily blocked earlier this year after army general Jean-Louis Georgelin, the Grand Chancellor of the Legion, voiced reservations about his use of cannabis and anti-war politics.